NetDiagram is a general-purpose software component that can be used to display various types of flow diagrams and charts in web applications. It is implemented as a .NET web control and can be easily integrated into any project targeting the Microsoft ASP.NET platform. NetDiagram can give graphical representation to object hierarchies, graphs and networks, entity-relationship / database diagrams, IVR systems, organizational charts, and more. ...... / database diagrams, IVR systems, organizational charts, and more. 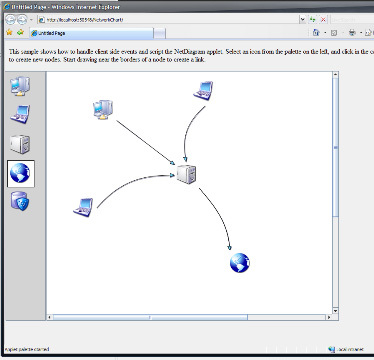 NetDiagram ASP.NET Control is runtime royalty free. Apart from the per-developer license fee, there aren't per-server or per-user deployment fees required. Remote control and administration tool for local networks. ASP.NET server controls to build a sitemap of your website. Qweas is providing links to NetDiagram ASP.NET Control 4.2 as a courtesy, and makes no representations regarding NetDiagram ASP.NET Control or any other applications or any information related thereto. Any questions, complaints or claims regarding this application NetDiagram ASP.NET Control 4.2 must be directed to the appropriate software vendor. You may click the publisher link of NetDiagram ASP.NET Control on the top of this page to get more details about the vendor.